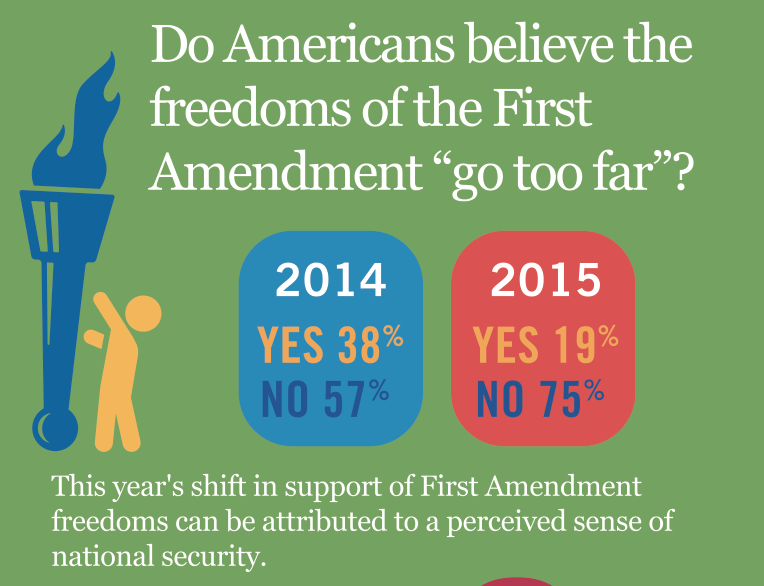 The State of the First Amendment survey, conducted each year since 1997 by the Newseum Institute’s First Amendment Center, tests Americans’ knowledge of their core freedoms and samples their opinions on First Amendment issues of the day. The survey again found that most Americans are unable to name more than one or two of the five freedoms in the First Amendment —religion, speech, press, assembly and petition— and that one-third cannot name any of the five. Looks like a great opportunity for history organizations! This entry was posted in Community engagement, Historical interpretation, History and tagged Constitution, Newseum, State of the First Amendment, Survey on July 7, 2015 by Max van Balgooy.